Government to launch national fitness day. Cabinet has endorsed the creation of a National Fitness Day to address the raising burden of Non-Communicable Diseases (NCD) like diabetes, cancer and hypertension. According to a statement issued by executive director of Uganda Media Centre Mr Ofwono Opondo, the resolution to launch the National Fitness Day on July 8, at Kololo Ceremonial Grounds was reached during a cabinet meeting chaired by President Museveni on Monday at State House, Entebbe. The day, according to the statement will be celebrated under the theme "my health is my responsibility"
Mr Opondo said the National Physical Activity Day is aimed at encouraging the population to adopt physical activity as a routine in their lifestyles in order to prevent Non-Communicable Diseases. 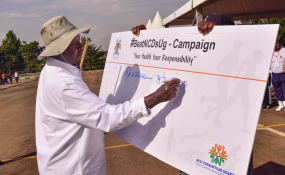 It will also will be used to equip members of the public with more information about the importance of physical activities in prevention and control Non-Communicable Diseases (NCDs). At the physical fitness day, according to Mr Opondo, experts in the area of NCDs will provide talks and also conduct screening for major diseases and their risk factors. This decision by government to earmark a national fitness day comes after a study by the Ministry of Health indicated that one in every four Ugandan adults has an altered heart function in form of raised blood pressure. According to the study, a majority of Ugandans were considered physically inactive. Dubbed "Uganda National Non-Communicable risks factors survey", the study whose results are yet to be officially released showed that raised blood pressure (BP) is more prevalent among males, standing at about 26 percent compared to 23 percent among women. A majority of the 3,987 study participants, who presented with raised BP, were not taking medications for lowering blood pressure, according to the study findings. "A normal person should have at least 160 minutes of exercises every day and that reduces the risk of getting heart disease, obesity and management of sugar," Dr Lwabi said, adding that people should eat wisely. He said increased cholesterol and a raised blood pressure predisposes an individual to heart disease and stroke, resulting into death. Today, the Health Minister Dr Jane Aceng is expected to address journalists about how the National Fitness Day will act as a means of increasing awareness on increased physical activity.